Learn about pumpkins from spring planting to fall harvest and beyond in three short, educational chapters. 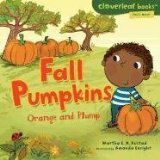 Warm hued, cute illustrations show the science of seeds, explain the basics of pollination, and show the changing seasons as the pumpkins grow. Post-harvest kids learn a few uses for pumpkins including pie, jack o'lantern carving for Halloween, and even saving some seeds for planting next year. Included are is a recipe for Roasted Pumpkin Seeds. Our family is fanatical about fall. It's a very short season for us so we make the most of it by decorating for Halloween and enjoying the changing weather. One of our favorite activities is choosing pumpkins for carving and deciding what to do with them. With a toddler in the family some of these activities are a great chance to teach while having fun. FALL PUMPKINS: ORANGE AND PLUMP is exactly what I was looking for. Teaching our tot where the big, pretty pumpkins she adores came from might be a little over her head at just 2 but she loves the illustrations and this book will be enjoyed for several more years. I know some families do not like or celebrate Halloween and would like to note that it is only mentioned for a single page where the children in the story are dressed up as a pirate and a witch. If you're looking for an educational, interesting read for a pre-schooler or young reader with a curious mind this is a terrific book. Science made simple but retaining its factual basis, this book is both cute and smart! Notes: Received digital review copy via NetGalley.